The winter of 1944 was a blustery one. ..but it would soon turn torrid. 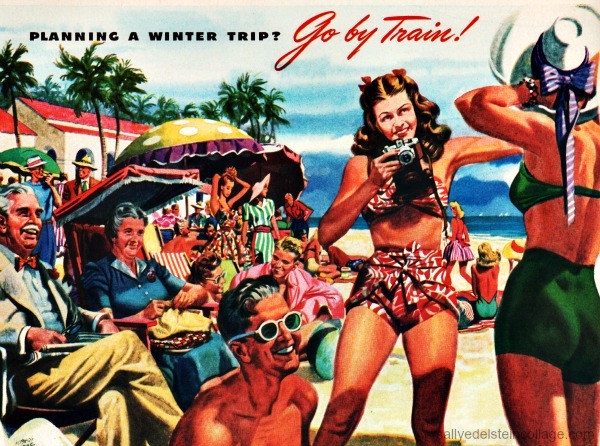 Christmas break, my 18-year-old college freshman mother Betty hopped on a Pullman, joining her family for a well needed vacation in balmy Miami Beach. The glow of health that would come with a trip to sunny Florida would work wonders for chilly, war-weary souls, restoring pep and vitality. On top of which, to my coed mother’s delight, Miami was swarming with soldiers. 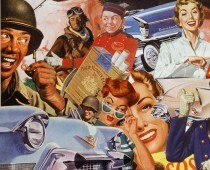 Betty would be stationed in seventh heaven..
Miami had become a mecca for the military. 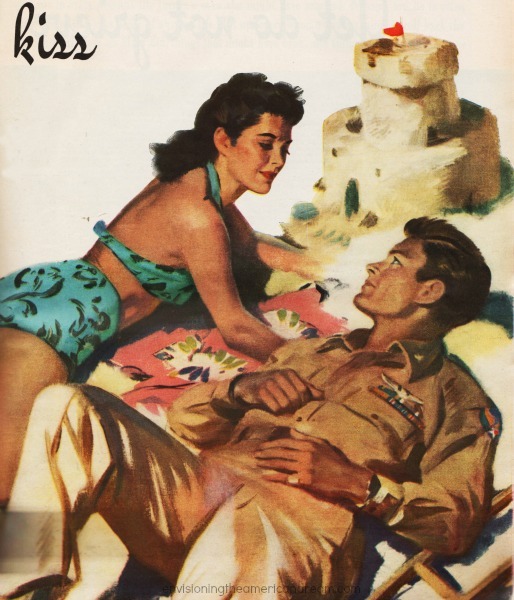 Because of the good weather, the Army and Navy had located bases, training schools, and rehab centers there, and the Army still operated most of Miami’s snazziest hotels. When she met Stanley, a marine who it just so happened was stationed at the hotel next to hers, she knew this was it! He was a khaki Casanova who swept her off her feet; the dream guy she was always talking about had really come to life. He just popped up suddenly out of thin air…in of all places… on a Pullman! 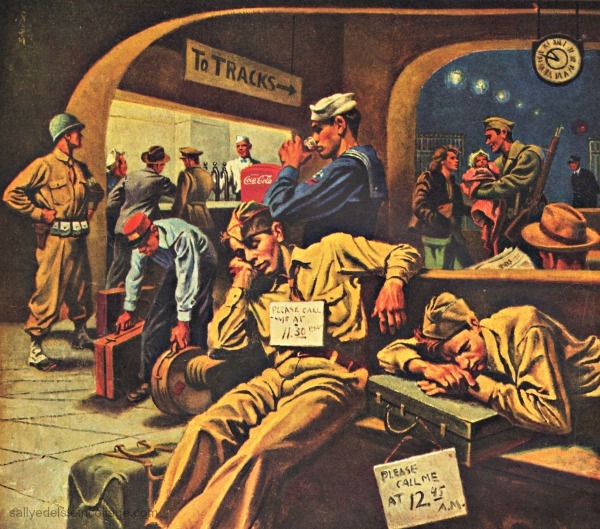 Train traveling had changed during WWII. Wisely, her family had purchased train tickets far in advance. Due to the war, trains were at a premium, with priorities going to the armed forces. Besides troop movement, there were those who had to travel on essential war business. There were service men on furlough; there was the shortage of tires and the rationing of gas- all added to the demand for space on the train. 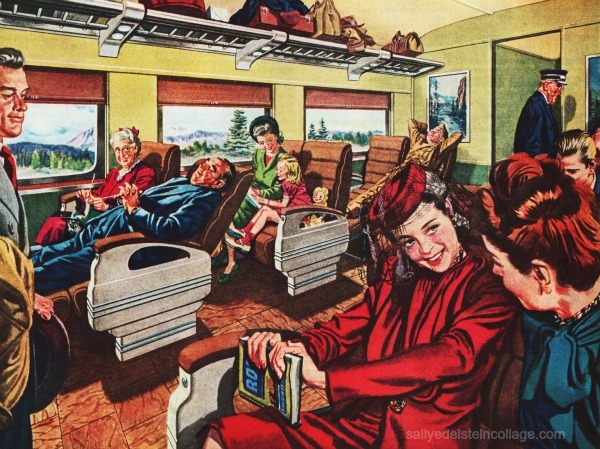 Once on board, Betty chose to relax in the trains observation car. With its glass enclosed loggia, solarium sized windows, radio, soft lighting, it was the perfect place to settle in with a stack of current periodicals that they provided. 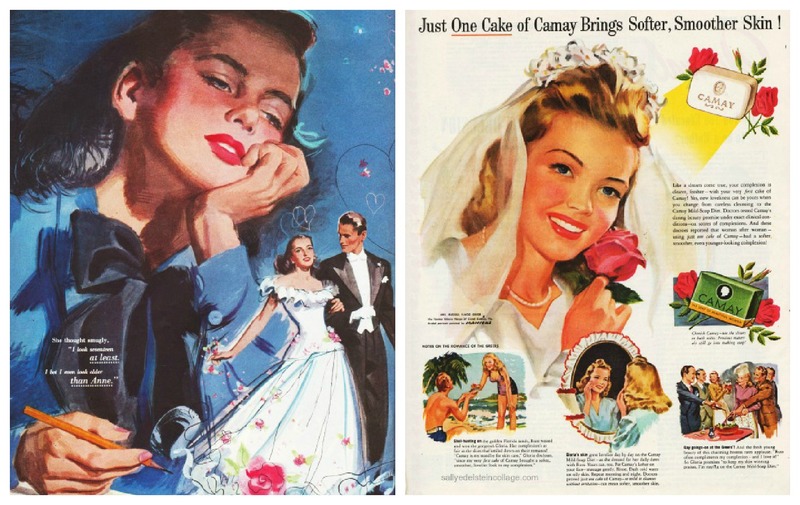 All the women’s magazines seemed to be loaded with stories of war-time romance, setting her pulse racing. 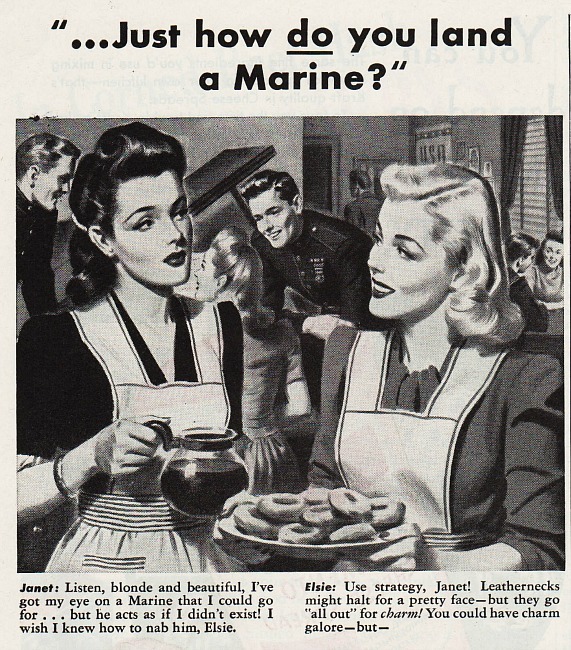 But due to the shortage of available men on the home front, she often wondered whether they weren’t rationing love too. Now with the prospect of all those soldiers milling about Miami, she had her heart set on landing a marine. After all Valentines day was just around the corner! It wasn’t very difficult to find out what appealed to a man and how to snare one. 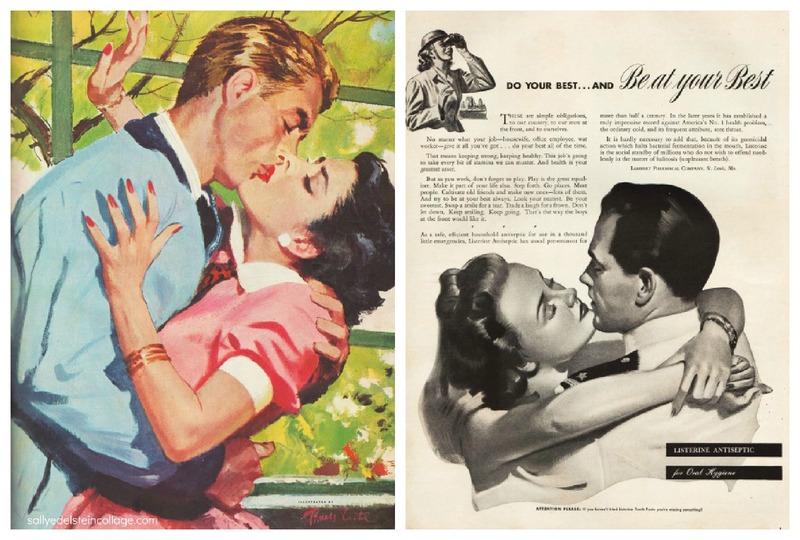 All she had to do was thumb through the plethora of articles and advertisements in her favorite magazines, each dangling the key to finding romance, often with little difference between the two. They all had one thing in common. They convinced their female readers that they were waiting for something, always in a state of readiness, of expectancy, of waiting for their real lives to begin. “Sometimes one little improvement in personality, looks or grooming can alter a girl’s entire life…and make it a thing of joy and beauty,” Betty read with keen interest. Take the story of Mary for example. “Mary was a successful career girl…attractive and well dressed. But somehow she simply didn’t click with men. More than all else she wanted marriage. But here she was without a single prospect. Then quite by chance she overheard a conversation that revealed the truth about her. She lost no time in doing something about it! Today her good-looking husband thinks ashes ‘the sweetest girl in the world…and she is …now! Don’t take a chance with bad breath. Don’t offend needlessly. Use Listerine ” . “Thousands of popular girls prefer Mum. Mum takes half a minute more or that heavy date may be a dud. That’s the smart girl ! 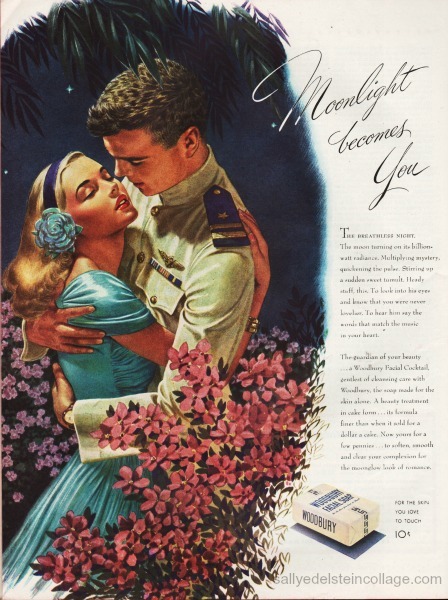 Wouldn’t he be disillusioned hero if you let underarm odor spoil your evening- and shatter his dreams of dainty you. And you might never know w hat happened. 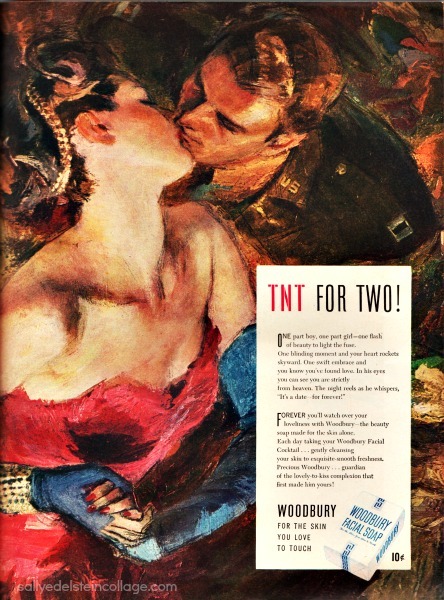 “TNT For Two– one part boy, one part girl-one flash of beauty to light the fuse. Absorbed in her magazines, she suddenly glanced up. They moseyed into the bar lounge with its luxurious lounges and comfortable chairs the very symbol of the sophistication, taste and fun of railroad travel. Betty couldn’t remember very much what they talked about …except when he asked her to go dancing the very evening they arrived in Miami. She was right on schedule for her trip to romance. Arriving in Miami, she lolled around with the other brown backs alongside the pool at the swank Roney Plaza Hotel, recently returned back from the army. Totally redecorated, the Hotel had the nerve to charge -gasp- $35 a day for a room! Relaxing by the pool, guests could get a quick “parboil” under its spreading “sun-tan-tree.” Clever tin foil leaves reflected the sun and sped up tanning. Wise gals knew that when m’ lady’s skin is softy and fresh, romance was at your beck and call; believe it young lady, nothing caught a mans eye like a good coat of tan. “Be the thrill in his furlough,” Betty hummed to herself as she dozed off under the blazing sun.